Brassicas: Your first question might be “what on earth is a brassica?” Basically, brassicas are members of the mustard family, which include broccoli, mustard greens (of course), brussels sprouts, cabbage, cauliflower, kale, many Asian greens, turnips, and more. They tend to be cold-hardy, and like many vegetables, are delicious after a freeze. They are at farmers markets because they can be protected and last fairly long even in winter. Root vegetables: There are a few root vegetables that are actually brassicas, such as turnips and rutabagas. But no matter the biological family, root vegetables are the stars of winter and holiday meals. Carrots, parsnips (an extremely underrated veggie), potatoes, beets, rutabagas, turnips, sweet potatoes, salsify, etc. all store well, hence their perseverance into winter. They are also quite versatile, and are delicious whether you just roast them plain with a bit of salt and pepper, or try them pureed for a gourmet treat. Winter squash: Winter squash, including pumpkins, can store a long time if you cure them properly. They also are quite tasty. Think outside the pie pan with them, as they make delicious soups and casseroles. Pumpkins are also quite tasty roasted with a little butter and salt. Leeks, onions, and greens: Leeks and onions store well, so you can find them at farmers markets. Potato leek soup is a delicious, warming meal on a cold day. Also, many winter CSAs and farmers markets can grow greens in cold frames and greenhouses during the winter, since many are cold hardy and fare well in cool weather. So, you can still have a fresh salad on a cold day. Apples: Apples store a long time, and if you want to make a pie with local apples, you can certainly find them at places like Way Fruit Farm. You can also bake them by coring them and stuffing the cavity with brown sugar, butter, and cinnamon. Very simple and tasty dessert. As for where to find these delicious fruits and vegetables locally this winter, check with your favorite CSA to see if they have a winter share program. 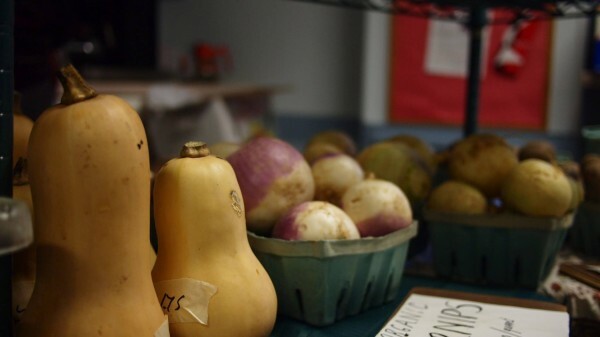 There are also there local indoor winter farmers markets, including the State College Farmers Market, Millheim Farmers Market, and Boalsburg Farmers Market.